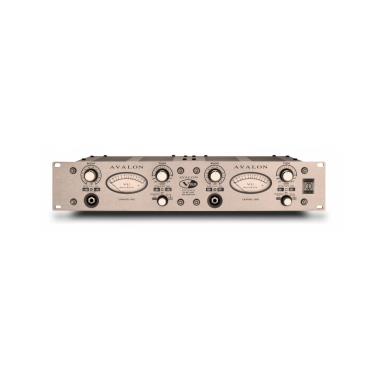 The Avalon V55 Dual Channel DI-RE-MIC PREAMPLIFIER is an ultra-high performance professional preamplifier, DI and RE-amper. Created for maximum versatility, the V55’s sonic signature - “Deep and Controlled Bass, Musical Mid-Range and enhanced Vocal Projection” combine with a unique set of user features including, 100% discrete Pure Class A amplification, Avalons’ unique “passive” TONE-BANK™, professional VU meter with dual peak LED’s, multiple outputs including an instrument level transformer isolated Re-amp. 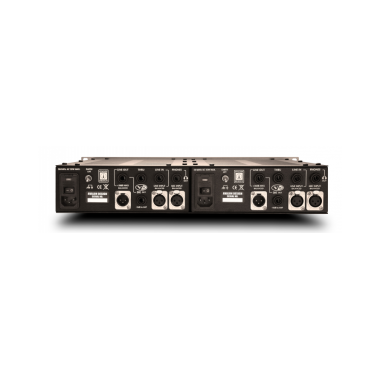 Designed to optimize absolute signal integrity and musical performance, the V55 is ideal for ribbon, dynamic and condenser microphones, bass guitar, acoustic instruments, electric guitars, keyboards, synthesizers and low output passive pickups. The state-of-the-art DI input stages, provides two channels of very-high impedance for “zero-load” effect on sensitive pickups and keyboards, while maintaining massive input headroom to +36dB before overload. offered in other Avalon preamplifiers. This feature empowers the V55 with a new scale of sonic character. The V55 includes two very high quality input transformers (same as the Avalon VT-737sp) with dual microphone input impedance loading for perfect mic/cable matching, high-cut switch for eliminating unwanted acoustic pickup and high frequency noise, headphone monitor amp and DC coupled, 100% Class A output amplifiers for defined bass control. A buffered “thru” output for zero-instrument-load tuners or power amp inputs, internal toroidal power transformers with discrete high-voltage power supplies for low noise and sealed silver relays for transparent signal routing.